The easy way to get summer ready and beach beautiful! This refeshing vitamin enriched beverage contains specially formulated ingredients including Vitamins A, C & E and Beta-Carotene to help promote tanning while also caring for your skin! Beta-Carotene: Kick starts melanin production in the skin by sunlight interaction. 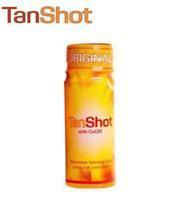 Added amount stimulated in the body by TanShot results in a promoted tan. Vitamin E: Helps tighten the skin and give a fresh, youthful appearance. Increases collagen in the skin. CoQ10: Known anti-ageing benefits. Reduces the appearance of wrinkles. Increases skin's firmness, smoothness and flexibility. Promotes natural collagen production.